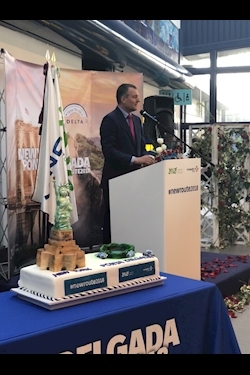 Delta customers and employees celebrated the inaugural nonstop flight between New York-JFK and Ponta Delgada, the largest city in the Azores on May 25. Friday's flight makes Delta the first U.S. carrier to fly to the Azores in nearly 80 years, since Pan Am last operated there in 1939. One of the most beautiful and remote places in Europe, the Portuguese archipelago has been called Europe's answer to Hawaii and the next big vacation destination. 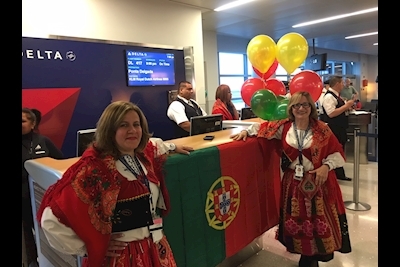 The celebration began with a gate celebration in New York, where customers enjoyed Azores-inspired pastries and entertainment by traditional dancers. Upon arrival in Ponta Delgada, the flight was greeted with a traditional water cannon salute. After disembarking, customers were met by local dignitaries, airport staff and Delta employees who distributed regional gifts and welcomed them inside where the festivities continued at baggage claim. "Delta is delighted to add another unique destination to our network," said Corneel Koster, Delta's S.V.P. - Europe, Middle East, Africa and India. "Portugal and the Azores are growing in popularity with U.S. tourists, as evidenced by record numbers of American visitors to Portugal last year. This is a great time to start our service." "Today, we reinforce the connection between the United States and the Azores," said Marta Guerreiro, Regional Secretary for Energy, Environment and Tourism. "With nine islands providing outstanding landscapes and a mild climate all year long, travelers here will find an authentic and natural paradise." The New York-JFK to Ponta Delgada route, which will operate five times a week throughout the summer, joins the new service from Atlanta to Lisbon and the existing daily flight from New York-JFK to Lisbon, which launched in summer 2017 and resumed on May 3 as a year-round operation. With the addition of these routes, Delta has tripled capacity to and from Portugal.